This farm was about 250 acres in size and had originally been on both sides of CR 1270N. Shortly after moving to this farm Oscar and Grace sold about 40 acres on the south side of the road to son Milton. He built a house, barn and other structures and raised his family there (See Milton Farm). 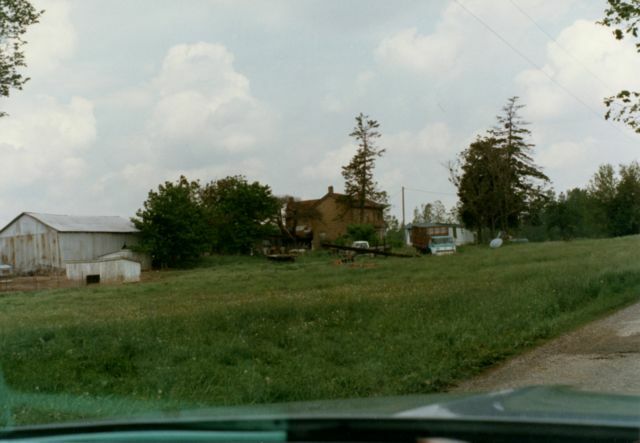 The portion of the farm on the north side of the road extended north beyond the boundary between Delaware and Blackford County and the north side of the land faced W. Mohee Rd. in Blackford County. I remember there was an old steel windmill sitting on top of a hill near Mohee Rd. on the property which supplied water for the cattle which grazed there. These windmills had a pump attached which pumped water from the well underneath into the water tank. There was a mechanism that would allow the tank to get full and would stop the pump action once it was full. The kids would walk through the woods and go fishing in the creek on the east side of the property (Fiddler Ditch). Later they created Lake Mohee which was fed by Fiddler Ditch. I remember going to this farm often and playing in the big barn in he hay mow There were always lots of pigeons around the barns. I would help with the hay baling and my cousin Art and I would get the job of being up in the hay mow as the men fed the bales of hay up the elevator from the wagons. Our job was to move the bales to the back of the mow and stack them. This job was done in July and August when it was the hottest and when the temperature was 85 or so outside it would be over 100 in the the hay mow. What a miserable, hot and dirty job. The men were able to feed more bales of hay up the elevator than Art and I could handle and we soon would be overwhelmed and have to tell them to stop for a while so we could catch up. So they took a break while we worked to clean up the accumulated bales of hay. I also remember there was a horse trough just behind the house near the smaller barn which had these huge goldfish which kept the tank clean. It was a round wooden tank with a faucet that would automatically fill the tank when the water level would lower as the cattle drank the water. The amazing thing about these fish was that the tank would freeze in the winter with the fish encased in the ice but next spring when the ice melted the fish would come back to life. I don't remember anything about this house. 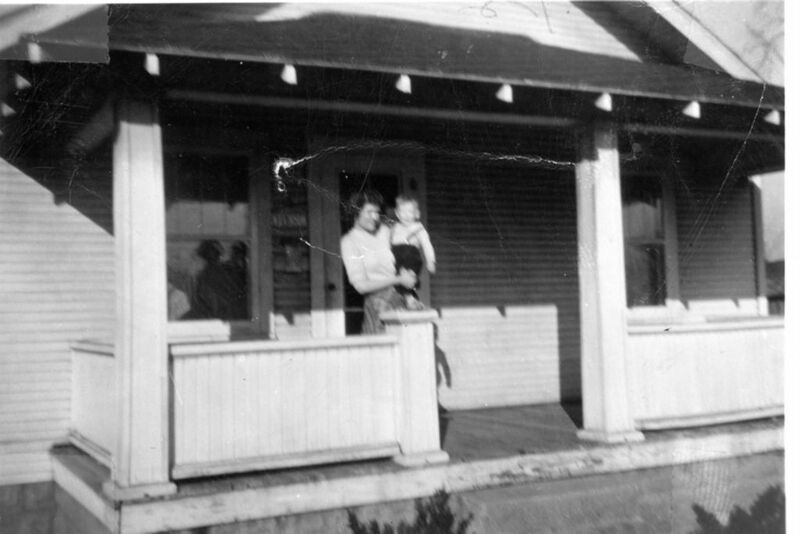 According to stories it was a nice little house that did not have a bathroom when we moved into it in 1945 so Dad installed a small bathroom in the rear portion of the house. This was the first house for the new family and with Walter just back from the War and a new GM worker things were looking up. The War was over and the economy was improving, people were buying houses and cars and spending money again after a long dry spell. In October 1946 brother Phil became the 4th member of the household. This house also had a garage on the alley behind the house. I had my first dog at this house. His name was Jackie and he was tied to the clothesline in back of the house. He was a small black and white dog that I only know about because of pictures and stories. Someone eventually stole him according to Dad. 16th St House - Looking East Norma, Walt, Jr. 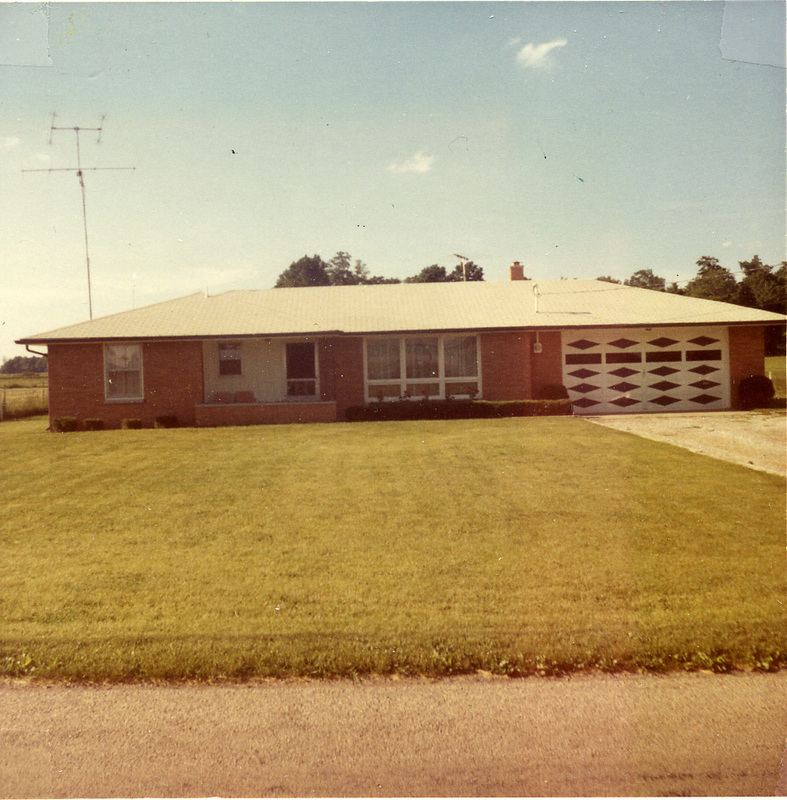 This house, in 1974, was located far off the highway and there was a concrete drive leading to the house. The house had 3 nice sized bedrooms, living room, family room, kitchen, laundry area and a 2-car detached garage. It also had a large patio. The house sat on about ¾ acre. Today the highway is much closer because of a widening project that took place around the year 1999 which expanded the highway from a 2 lane road to what is now a five lane highway. 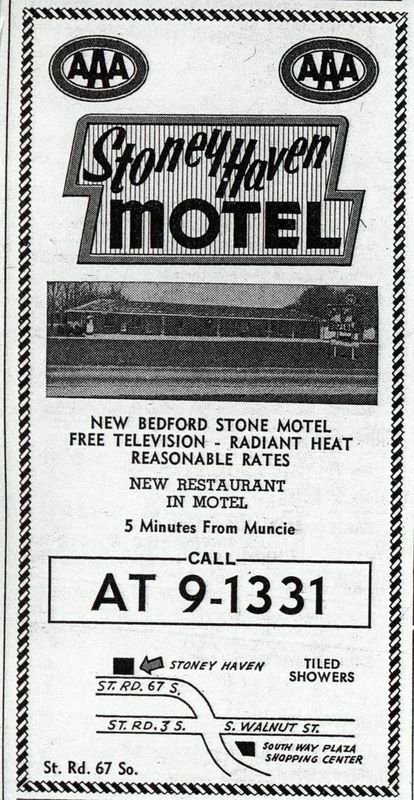 - South side of E Centennial Ave, somewhere between Muncie Bypass (Highways: IN 67, IN 3 and US35) on the west and Country Club Rd on the east – probably closer to Country Club Rd. 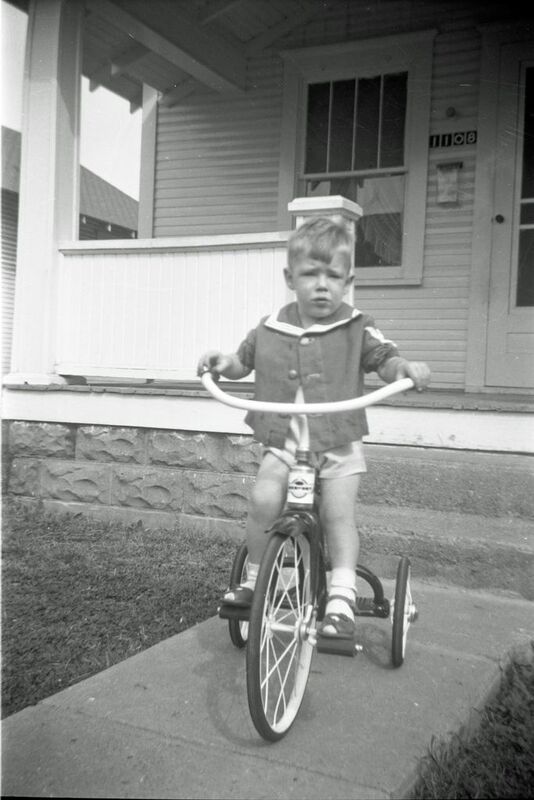 At the time we lived in this house it had a brown shingle-like siding, much like roofing, that was popular at the time. As I recall there was a detached garage or a building of some sort behind the house. There was some acreage maybe around 5-10 acres. This is the first house I remember but not well. I remember there was a small store at the end of Centennial where I would get a bottle of Grapette soda pop. I also remember there being a big stone house on the north side of the road near our house. Mostly my memories are from pictures. I vaguely remember this house. 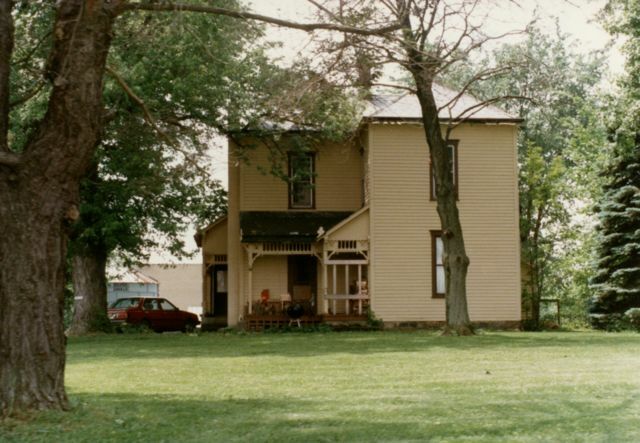 There are picture of me as a child laying on a large blanket in the barn yard of this house. 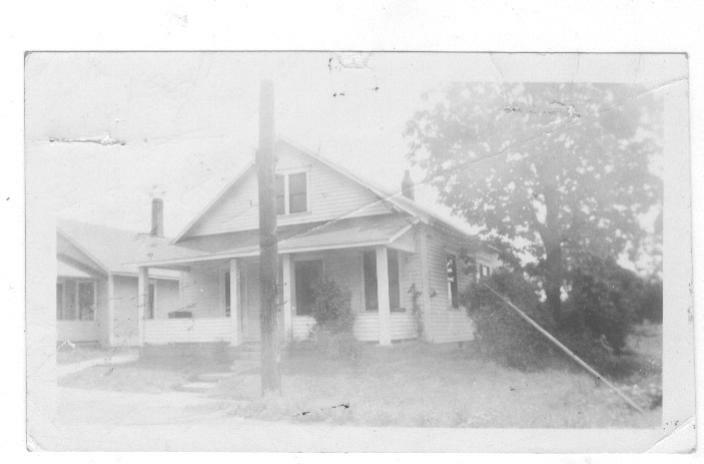 I remember that Uncle Milton had his welding equipment in the garage or out building which was near the house. I called this the Fairview Farm because it was near a little community in Green Township by that name and Dad talked about going to Fairview to the store. This is the farm where Dad lived when he was inducted into the Army. The large oval to the east of the location of the house is the Sun Valley Speedway (Anderson Speedway today). There was a large, tall, wooden fence surrounding the speedway. This fence was directly behind the house and we were able to climb up on top of the shed next to the house and watch the races. Joe Helpling, who owned the speedway at that time, would come around and run us off. The house was very small and sat behind a restaurant belonging to the owners of the house (Herb and Garnet Brown). The restaurant was called “Brownies”. Shirley and I rented this house and Shirley worked part time in the restaurant. The house had green siding. It was a one story building that, according to Herb Brown, had once been a chicken house. They had remodeled it and turned it into a rental house. It consisted of a living room two bedrooms, a kitchen and bath. It was a very comfortable home for a new family to get started with. 1-story brick ranch house with blacktop drive and sitting on ½ acre. It had 3 bedrooms, 1 bath, living room, kitchen and 2-car attached garage, with a fenced-in back yard. 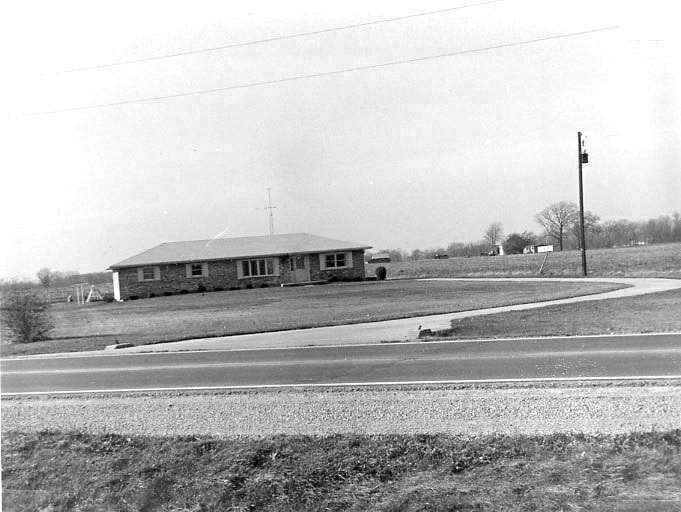 This home was newly-built when purchased by Walt Robbins, ID0005 and Norma Louise Haas Robbins, ID0006. They lived in it until they built another new house south of Yorktown in 1966. 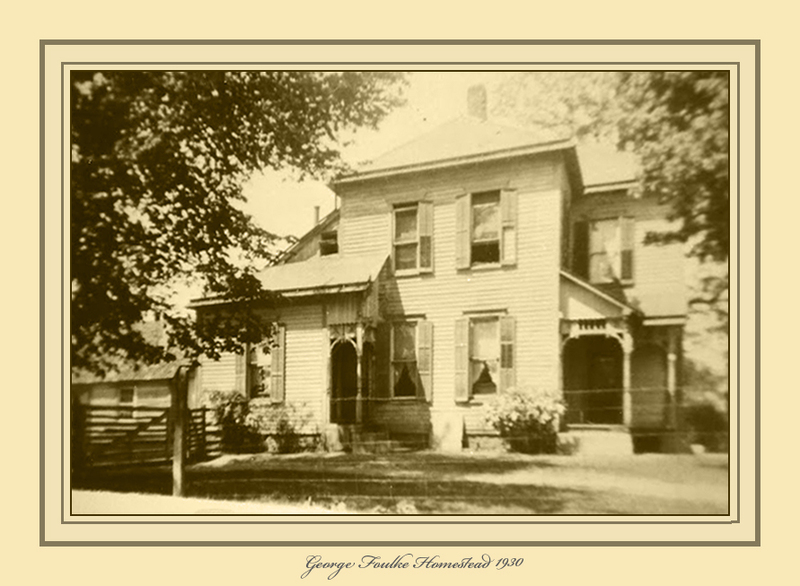 The home was built by a local builder George Harlan ID0568. This was the first new home for the family. The home was purchased in 1966 by their son Walt Robbins, Jr., ID0001 and Shirley K. Musick Robbins, ID0002 for $16,000 - PDoc0258.pdf. 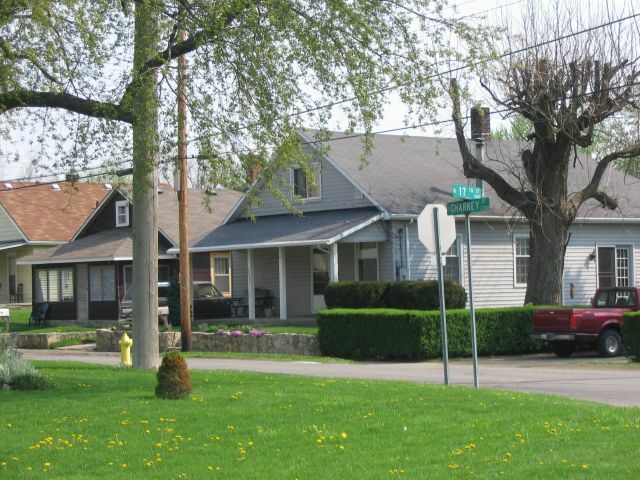 They ived in the house From 1966 to 1973 when they bought a house on Highway 67 south of Muncie [67S house #1]. Walter and Norma had decided to have a new home built south of Yorktown (400S House) and they selected Georg Harlan to build this house for them. There was a 4-room tenement house on this farm and it was located east of the big house. Mary Frances moved to the tenement house when the Ross Family was living there and she stayed when the Oscar Robbins Family moved into the big house. Clarence and Artie Green Lucas (ID0691 and ID0692), (Parents of Living Lucas ID0454) lived directly across the street (west) from this house - The house is now gone (2008) and it is a vacant lot. we moved, I took bed pillows and slid down the little bank to the sidewalk several times before i was caught. from Kentucky, while Martin was in the service after WWII. They, along with their children, died in a car crash sometime in the early 50's. - On the west side of Anthony Rd, about 1 mile south of present-day E. 236th St. 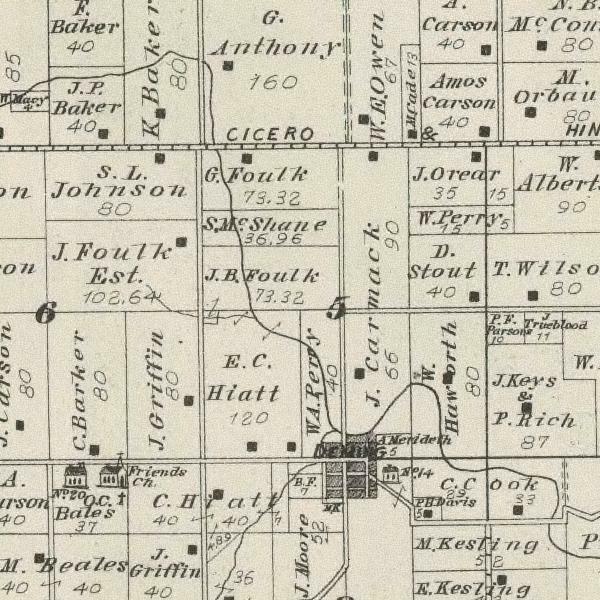 This image of the Jackson Township map shows the Jesse M. Foulke Farm - it is located on present day Anthony Road just south of 236th St. north of Deming. West side of Anthony Rd. Just south of 236th St.
Dad stated that they lived at this farm for a long time and that Myron had graduated from Cadiz High School. Grandpa owned this farm, he had a mortgage on it. 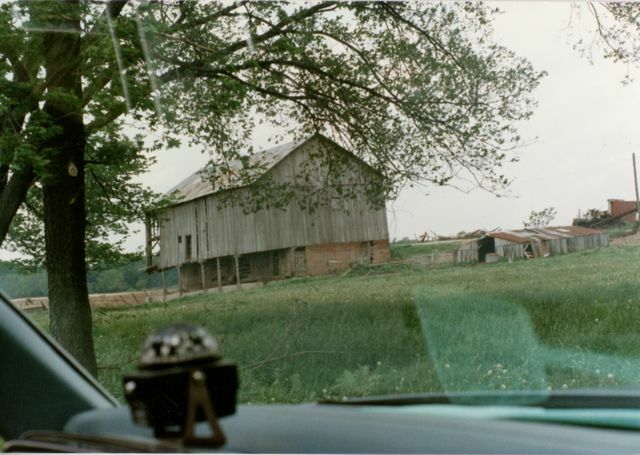 The farm consisted of 80 acres. They had 15 or 20 head of milk cows, had horses and Poland China Hogs - these were his dad's pride and joy. He kept 5 or 6 Poland China sows all the time and only raised this breed of hogs. His mother always kept 500 hens and traded the eggs she got to the grocery store for groceries for the family and then the store would sell the eggs. They also sold the cream from the milk cows and fed the milk, other than what they used themselves, to the hogs. After the house burned his dad built a new house on this farm. They were living at the Scott farm while he was building this new house. The new house consisted of an old house that he had bought, cut in two and hauled to the Cadiz farm. Once there he put it back together and did the refinishing, and adding porches, etc. Later, after they had left this farm this house that he had built burned and it was said that the next one on the farm after that burned as well. Dad thinks his dad lost this farm in 1929 or so. They couldn't afford to even pay the interest on the mortgage because it was during the depression. School Year was from Sept after Labor Day to the last of April. If they happened to start before Labor Day they could be excused to go to the State Fair. - This farm had a 32-volt DC electricity. When the house burned they let us live in the chicken house which was about a mile from Scott's farm - Not bad after it was remodeled. Oscar was also busy building a new house to replace the burned one on the Cadiz farm. This is the farm where the eagle landed on the fence and stayed a long time. Scott's Farm was about ½ mile west of Cadiz farm in Henry County - the house had a porch built out front - it was a 2-story house. Oscar and Grace rented this farm from a banker. They moved here dad thinks when he was about 9 [had to be earlier if he started the first grade here]. The banker paid the bills for Oscar to build the silo on the farm They had hired someone to do the concrete work. Walter filled the holed with concrete and Myron helped in some way as well. The silo was about 20 or 30 feet in diameter and about 20 or 30 feet tall. This farm was located about 2 or 3 miles from Shirley back east from Shirley and there was a railroad - the farm was next to the railroad. The farm was off of highway 234 about 2 miles south. Highway 234 goes north of Shirley to Kennard then north then east to New Castle. Paul Jarrell ID0053 told dad that if you take the Mechanicsburg Road south you would run into this farm. - Dad stated he started school - the 1st grade at Shirley School and that Myron and Ina went to Kennard H. S. because Shirley only had 6 grades. [Interview with Walter C. Robbins, Sr., 20 Sept 2005] Dad thinks he was 7 when he started school - This was a one room school, with one teacher and a pot-bellied stove in the center of the room - the water and outhouse was behind the school. They took a bus to Shirley and then Ina and Myron took another bus to Kennard. From what I can piece together now it appears that Dad was 6 when he started to school. S3 Book: Helm, T B, History of Delaware County, Indiana, with Illustrations and Biographical Sketches (Chicago: Kingman Brothers, 1881, Bk1595). S5 Plat Book: Farm Plat Book and Business Guide Delaware County Indiana (Rockford, Illinois: Rockford Map Publishers, 1952. Bk1869), page 43. S6 Delaware County Indiana Official Farm Plat Book and Directory (Madison, Wisconsin: County Plat and Directory Co., Inc., nd ); Acc000343 - Bk3332, page 33, 43. Note: I estimated the publication date from page 12 - the ad for WLBC Radio - they state they have been serving the farm home for 31 years and they were established in 1926. Dad remodeled the bathroom - originally it only had a stool sitting out in the middle of the room with no walls. He put walls around it and finished the bathroom adding a tub with shower and a sink and ran water to the bathroom. He also remodeled the kitchen by first fixing the the drooping ceiling - it probably drooped 6 or 8 inches in some places. He put in new ceiling joists and jacked up the ceiling to make it all level and put in a new ceiling. Had the house and barn painted. The barn had a metal roof. Dad installed stalls in the hog house for sows to have their baby's. The wood for these stalls came from logs out of the woods on the property. Dad hauled the logs to a saw mill in Matthews or Hartford City to have them cut into lumber. It was rough sawn oak and very hard. Dad bought a heavy duty 1/2" drill and a portable circular saw when he built these stalls and has these tools to this day. The hog house had a cement floor. The previous owner (Tatman) had been a tomato farmer and had built and used this building for something to do with the tomatoes but dad could not remember for what purpose. We raised around 200 head of hogs each year. We had them at our farm and also down at Grandpa Robbins' farm. Dad raised them at both places. The hogs were born in January and we would be up half the night watching over them, using pitch forks to move the baby pigs out of the way so the sows wouldn't roll over and crush them. At one time we had 60 head of Black Angus cattle plus 10 milk cows. At some point our milk cows got into the grainery and ate a large quantity of soybeans. They all swelled up and we had to have Dr Hyde, the veterinarian, from Hartford City come out. He opened up their stomachs in an attempt to relieve the pressure and remove the soybeans. Most of the cows died and dad had them made into hamburger. We had so much hamburger "we had hamburger out our ears." We had a fellow painting the barn - he worked with dad at Chevrolet. Instead of money dad gave him 200 pounds of hamburger as payment. He took the hamburger and forgot about it or something and it all spoiled - so he ended up painting the barn for nothing. Castrating the animals - Dad attempted to castrate some of the calves one time. He had watched Dr Hyde and he thought it looked simple enough. When he tried it on his own, however, he was not quite as successful as he would have liked. He had lots of bleeding. The calves survived but it was a mess and he never attempted that again - he left that chore to Dr Hyde. Dad was very proficient at castrating the hogs though and could do 40 or 50 at a time. He did try to do some little pigs that were only 2 or 3 weeks old one time but it was almost impossible to find their gonads so he never tried that again. Horses -- 1 black Norman Mare 8 yr old. wt 1500 lbs; 1 black Norman mare 7 yr old wt 1525 lbs; 1 bay mare 8 yr old wt 1300 lbs; 1 brown mare 5 yr old wt about 1200 lbs; all good mares. 20 Head of Cattle -- Including 12 head of 2 yr old steers, good feeders, 4 yearling shorthorn heifers. 1 coming 2 yr old Jersey heifer, 2 yearling Jersey heifers eligible to register. 85 head of Hogs -- Including 12 good brood sows, farrowing between April 1st to 10th. 75 head of good feeding shoats weighing about 100 lbs, full bred Duroc male. 16 head of good breeding ewes with lambs by side. Feed -- 10 tons of good timothy hay in mow. About 1000 bushels of corn in crib. Farming Implements -- 1 Milwaukee binder, 1 Deering mower, 3 riding cultivators, 1 Syracuse breaking plow 1 Corn King manure spreader, good as new. 1 2-horse wagon, 1 spring wagon, 1 three section spike tooth harrow, 1 good as new Delaval cream separator and other articles to numerous to mention. Terms -- All sums of $5.00 and under cash in hand. Sums over $5.00 a credit of 8 months will be given, purchaser giving note with approved free hold security. 4 per cent discount for cash to those entitled to a not. No property to be removed until terms of sale are complied with. Auctioneer: F. H. Wise, W. A. Miller, Ed Miller.